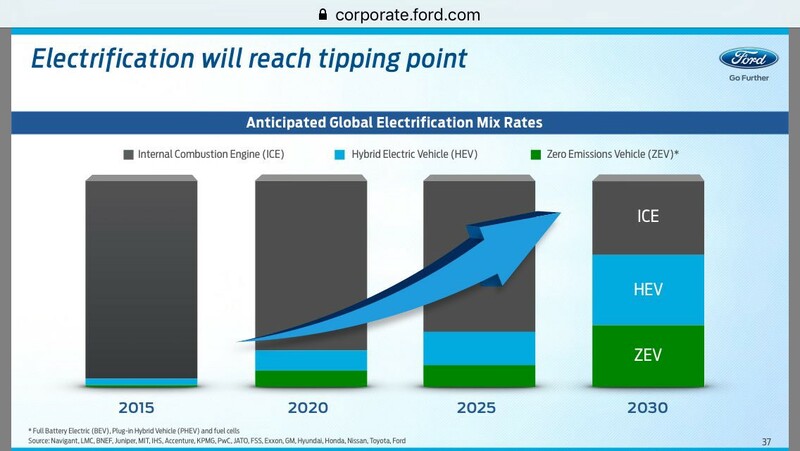 The chart above these lines is the reply on Twitter from Karl Henkel Ford’s Enterprise and Story Development Manager, to my request for an estimate on when his company would stop making internal combustion engines, following the points I made in a previous article published at Forbes. When Will The Motor Industry Self-Destruct? As he said, this is an industry estimate, based on the belief that electrical technology is still too expensive for most people, and that it will take another 15 years before the global supply of electric-powered vehicles reaches that of those powered by petroleum derivatives. A trip to the North American International Auto Show (NAIAS) in Detroit confirms this belief: in its press conference, Ford unveiled the new F150, along with the return of the Bronco and the Ranger, three gas guzzlers that aroused the passions of dealers eager to offer them to their even more eager customers. Here in Detroit, the so-called Motor City, is the gathering of car dealers increasingly disconnected and ignorant of an industry in which technology is increasingly the key component. The car industry depends on its dealers: they are the real customers, and is willing to defend them to the point of attacking anyone who tries to sell cars directly to the public. These are people, who as Henry Ford supposedly said about horses, worship power, and want to give the average American the chance to use that power. Walking round the car show, the company most conspicuous by its absence is Tesla, but it doesn’t matter, because it is widely regarded as an outlier to be ignored. The view here is to give the public what it wants. And that means giving pride of place to good old-fashioned high-powered petrol-engined monsters, and putting the hybrids and electric vehicles at the back. The NAIAS is still the show in which the industry flexes its muscle, with more and more diesel and gasoline engines on show as if there was no tomorrow, surrounded by booth babes, an unquestionably logical combination. Gasoline as a hormone enhancer. This is what my customers want, and this is what I will give them. That young people are buying fewer cars and seem more interested in using them as a service? That was just a side effect of the economic crisis; don’t worry they will return… because who wouldn’t to feel the cylinders of a Mustang roar under his right foot? This is an industry created by petrol-heads, in which there is no trace of leadership that might show customers where the future is really taking us. Customers want faster horses, let’s give them faster horses. The contradiction is there: Ford acquires Chariot and seems to bet on shared mobility, organizes a fantastic TED event talking about the future of cities and mobility, a panel with input from the mayors of Atlanta, Chicago, Columbus y Detroit, and closes with an impressively visionary conference of the great Jeremy Rifkin … but he starts his presentation with three monster trucks that would dry an entire oil well if you miscalculate the pressure on the pedal. This is an industry that prefers to give the customer what it wants, which continues to dream of more horse power, thirstier and faster vehicles, ignoring the potential of electricity and insisting that its problems are not in its products, but in the market. The truth is that today’s automotive industry is headed down the same road as the tobacco industry, poisoning its customers with every passing day. The reality is that hybrid vehicles are like low-tar cigarettes, a way of prolonging the life of the petrol engine while paying lip service to the environment: the industry doesn’t advertise electric vehicles because they have fewer accidents and require less maintenance, and that does meet the interests of the dealers. Does the automotive industry really believe in electric cars? Ford has managers in charge of truly visionary projects: my conversations last night with Jessica Robinson, manager of City Solutions, or Doug Moore of Mobility Solutions, showed me clearly that the company has expertise on such strategic and important issues as mobility or solutions based on efficiency… but they are there, in the background, while the company is really interested in the new F150, the Bronco or the Ranger. That’s the way it is. A company that still believes that diesel and gasoline engines will continue to play a significant role beyond 2030. A cigarette, anyone? This graph is a crying shame. If this graph was to be true, the automobile industry would have become the equivalent of the tobacco industry: manufacturing poison to kill its own customers. But getting out of its dead end is something that, as we can see, the industry cannot manage alone. It takes more external actors, more competitors like Tesla or more newcomers like Google to show that there is another way. I’m not talking here about dinosaurs. When I was here in 2013, several companies told me that self-driving cars had no future because people liked to drive, and that the public was only interested, at the most, in driving aids. Now, three years later, all brands have created some kind of autonomous driving prototypes. When it needs to, the motor industry can react. But this isn’t about reacting, it’s about leading. It’s about telling customers and dealers that things cannot continue in the same old way and that we need change now. And at least from what I have seen here in Motor City, there is no sign of leadership anywhere.